Remember my pouffes? The ones I made last year? 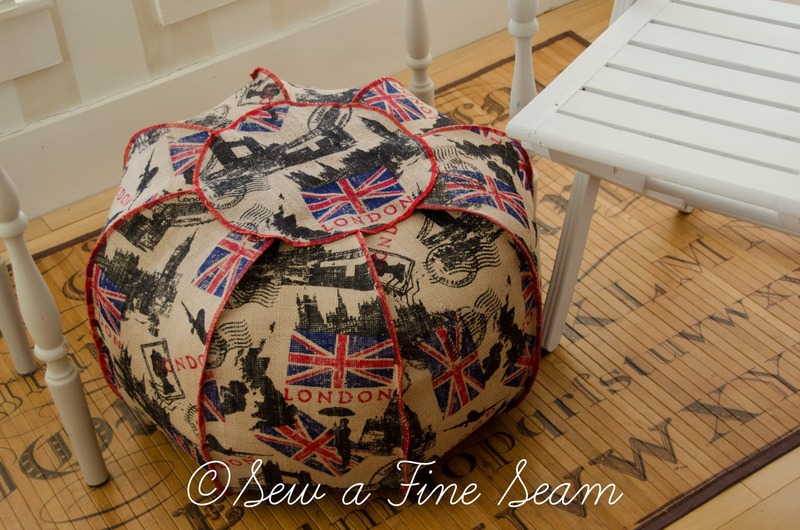 You can find pouffes I made that feature the Union Jack here and here. Want the pattern? It’s now for sale! And the instructions are right here on the blog with photos to show you how as well as the written how-to. a cushioned footstool or low seat with no back. And yes, I know that lots of places, including Target, sell items like this and spell it pouf. But I’m being stubborn and sticking to the proper spelling. 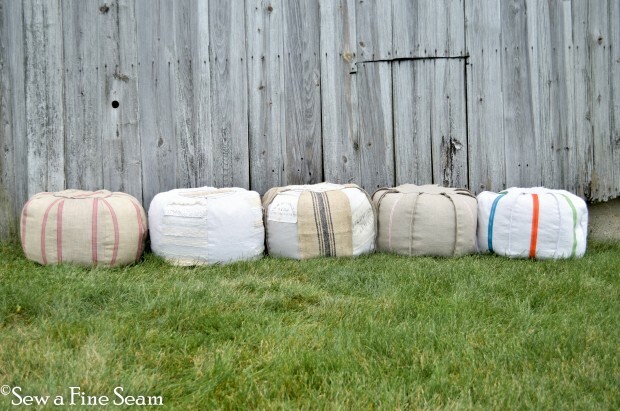 You can find (affiliate link) pouffes to buy – but why not make your own and personalize it to your own style and decor?! 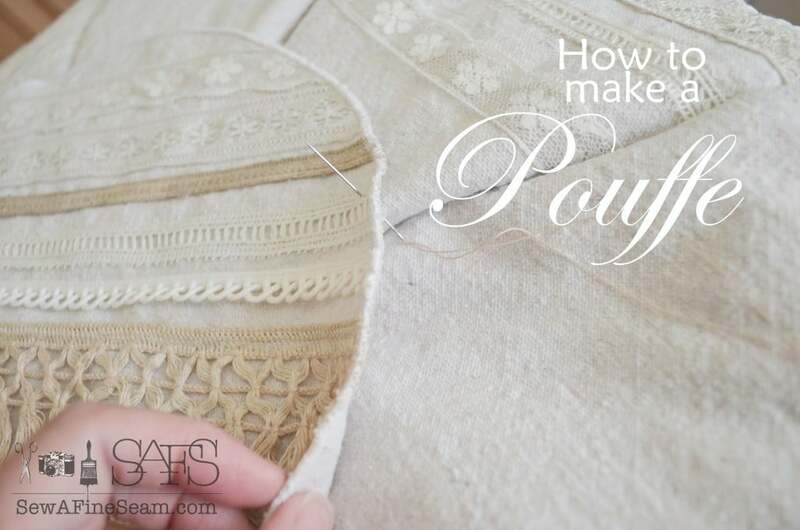 It is way past time for me to bring you the instructions for making my pouffe. The instructions and finished pouffes were featured in Jennifer Carroll’s magazine in October 2013. I intended to bring the instructions to the blog this past summer and never got to it. Today, finally, the instructions will forever be available right here! The pattern is available for sale here. Cut out 8 of the large oval shaped piece and 2 of the circle shaped piece. If you wish to embellish the pieces of your pouffe do this now. 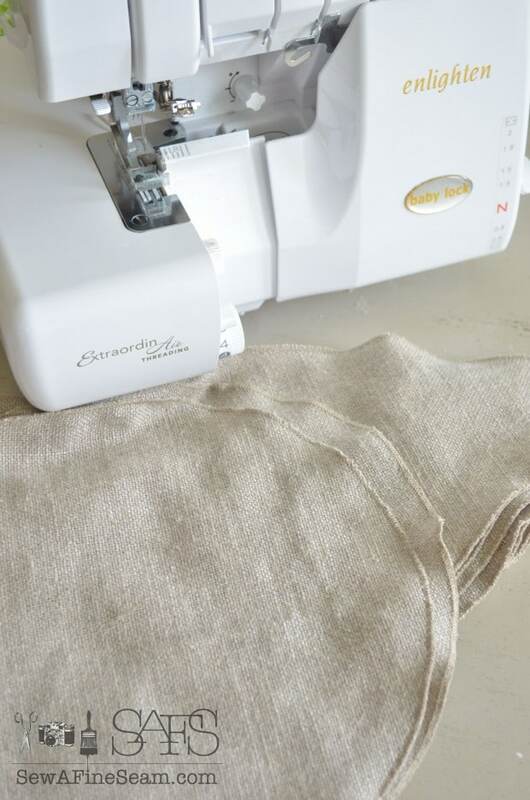 You can also finish the edges with a serger if you want. Raw edges exposed would work with some fabrics too. 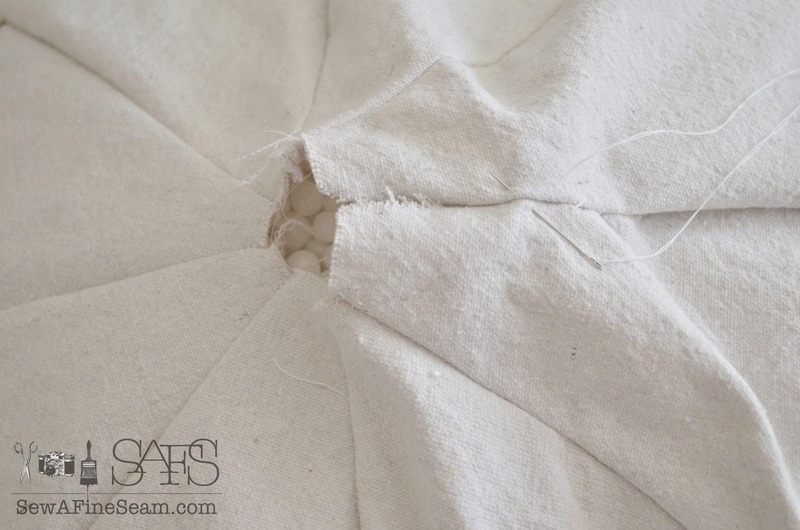 When all 8 pieces have been sewed together, sew the first and last piece together to complete the circle. 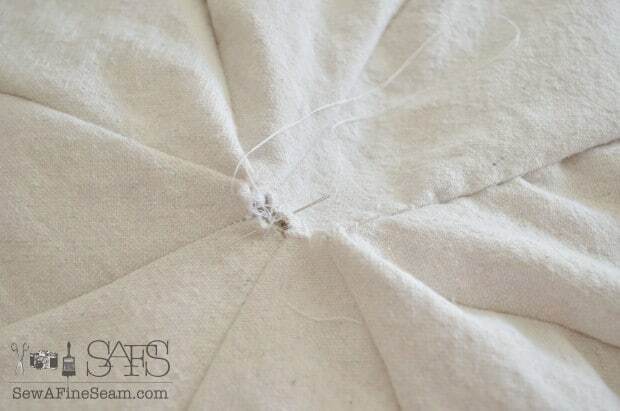 Leave an opening at the bottom end of this seam for filling the pouf. I leave the last seam open a bit because sewing it up completely doesn’t allow enough space to get the funnel into the pouffe for filling it with the bean bag fill. Hand stitch the top opening of the pouf together to keep the filling in as you fill the pouf. 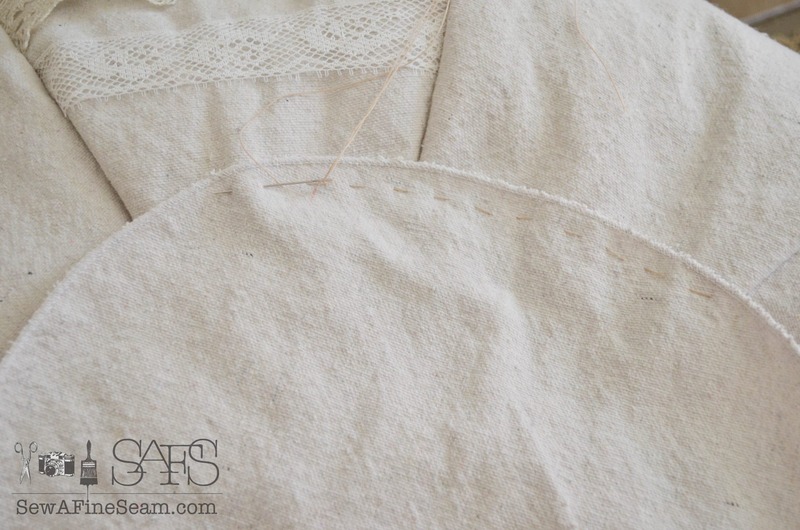 I have also used my serger to make a seam here to close off this end. 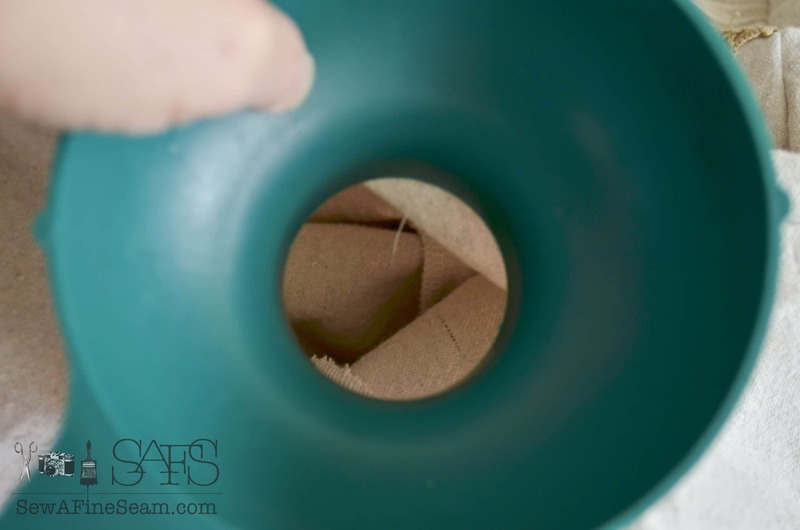 Turn the pouf upside down and use a large mouth funnel to fill the pouf with bean bag fill. You an buy a (affiliate link) wide mouth funnel here. Having (affiliate link) static guard on hand is a good idea as the bean bag fill is full of static. Spray the opening of the pouf and the opening of the bag to help cut down on the static. Filling is a two person job. One person needs to hold the funnel and lift the pouf occasionally to keep the fill falling into all the space. Pour slowly, the bean bag fill is very lightweight and any puff of wind will send it flying! 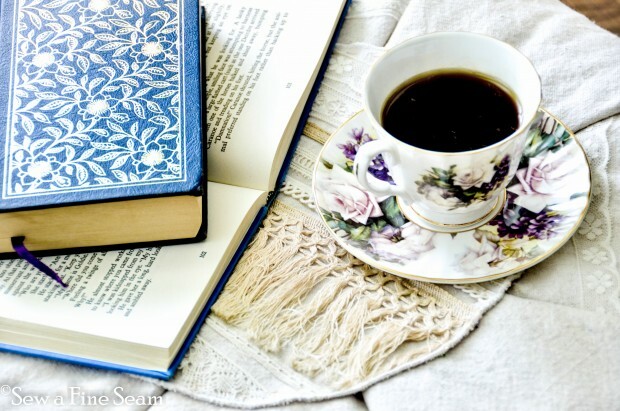 It is best to do this inside and away from other activity. When you are finished filling your pouf, whipstitch the opening closed. 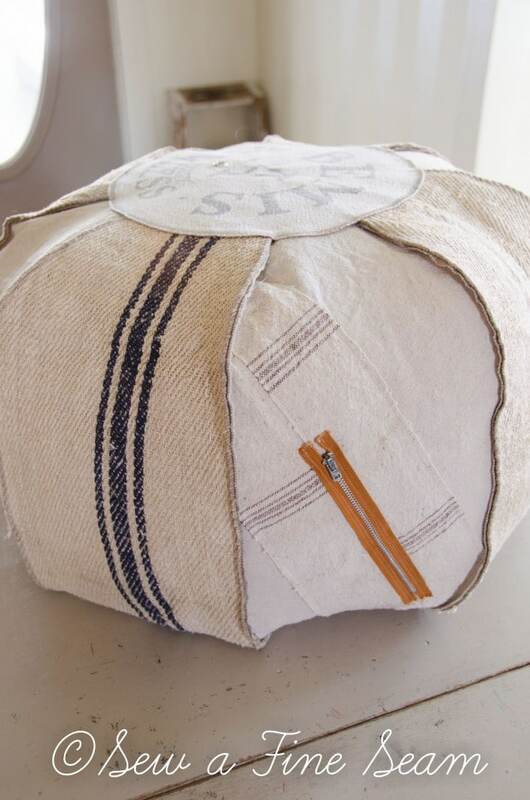 Center your round pieces over the top and bottom of the pouffe and hand stitch in place with medium sized running stitches. You can find the center of your circle by folding it in half and then in half again. 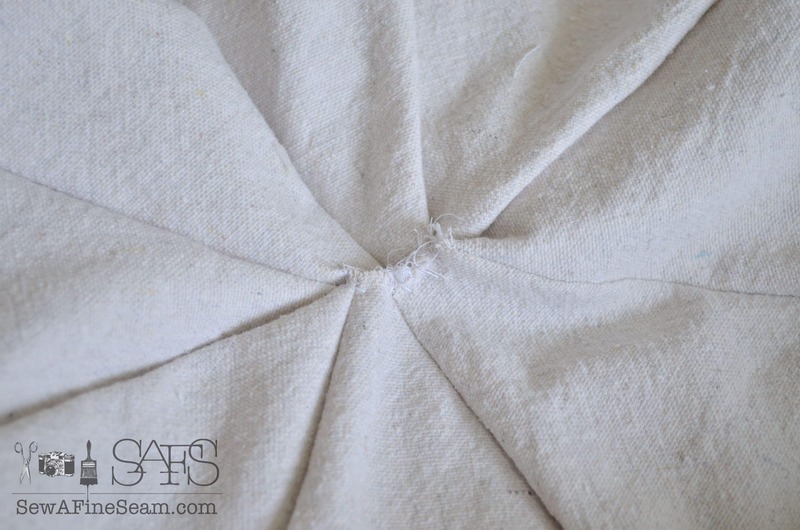 Place the point on the center of the pouf where all the seams come together, and unfold circle. 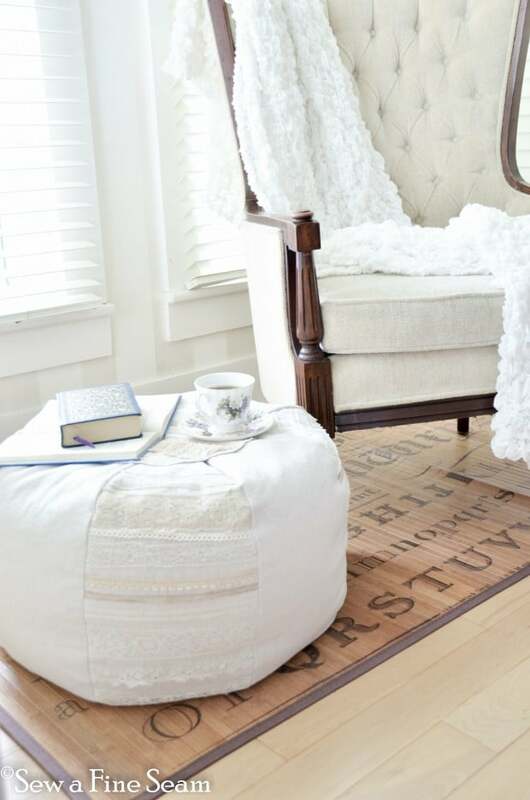 Sit down in a comfy chair, prop your feet on your new pouffe and congratulate yourself on a job well done! So will you make these for Christmas gifts? Or would you want one gifted to you? In all honesty, I would enjoy making it once I had my supplies and started in. There’s just always so many other things to stay busy at and I’m obviously not a crafter at heart. They aren’t hard at all. If you ever decide to try it you would have fun with it I’m sure! Thanks Hope! Have fun making them! Had to save pattern and how to Jill. 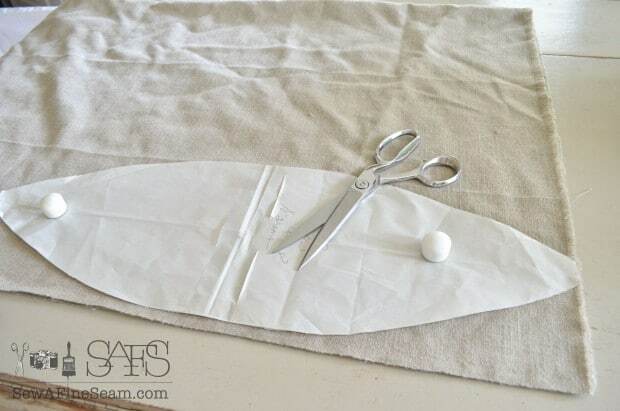 I might be able to do this if I can get my blankety blank sewing machine to work. Tried it week before last, no dice. I must be murder on machines, they see me coming and go awol.lol. Really. Would love to make couple of these. 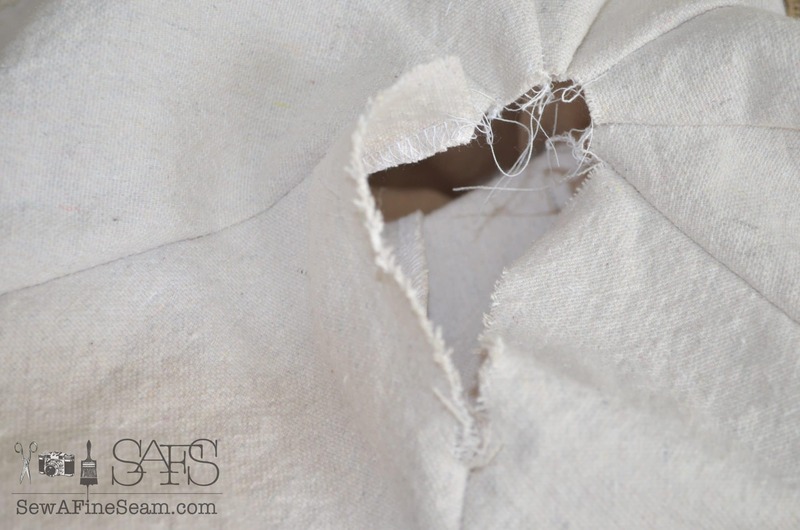 Did you use bleached drop cloth? I have a drop cloth but need to get some bleach, all I have is Oxi Clean, would that do it? Your pouffes looks so adorable. Love that London one, where did you get that fabric? Think granddaughters would love that one, maybe even daughter. Where did you get that huge funnel? Your spelling is quite correct. People shorten since they don’t know any better or are lazy. You do such a wonderful job with tutorial I just might be able to handle it. Have to be in right frame of mind. I go thru streaks where it seems my brain just isn’t about to do what I want it to, then I’m ok again for while, a sign of dementia already? Kinda scares me, I’m not that old. Am I? lol Hard thing to admit but I have noticed “off the wall” times now and then. Better get myself busy. Hope you had a great Thanksgiving. Were you with your Mom,sister, etc. for the day? Or your immediate family, hubs/girls? We went to daughter’s for dinner, was very nice. I had printed out some little cards for people to fill out saying what they are grateful for and we went around table reading what we’d said one by one. Son in law loves things like that. He comes from family of 7 kids and his Mom died earlier this year. We were so happy to spend time with daughter/family like we used to. Even took some photos on our digital camera. Happy week dear friend and enjoy the season. Is your house all decorated? I finally got Fall decos down Saturday night and put them away yesterday. Not in box but separated things into categories then into separate plastic bags for time being and hubs took them out to shed on shelf At least it’s not underfoot anymore. Been so busy making things hadn’t had time, house looks like cyclone flew thru. (REALLY). I hope you make one JaneEllen! It’s really not hard at all. I don’t usually bleach my drop cloths but I have before. Oxyclean probably won’t get it as white as bleach will. Thanksgiving was spent at home – we fixed a Turkey and all the trimmings! My parents came over for lunch and part of the afternoon. My sister and her family and my brother all live out-of-state so they weren’t here. 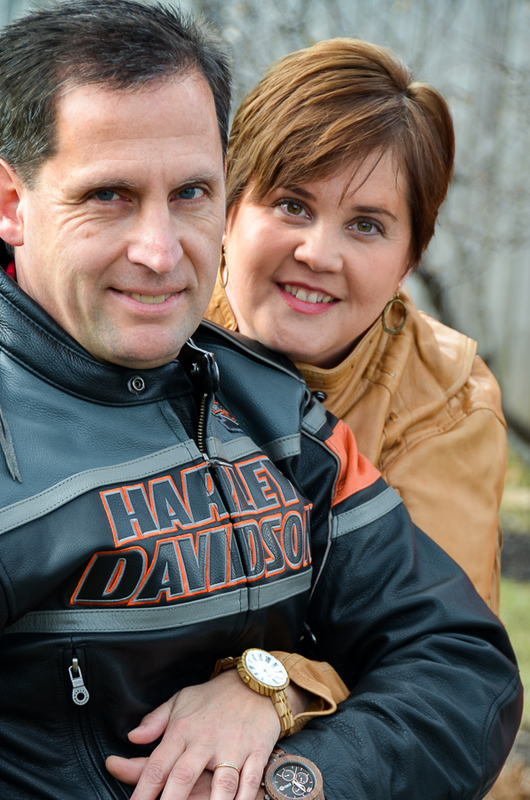 They will be here for Christmas if all goes as planned. oh the london fabric is a burlap I found at Jo-Anns last summer. The answer is definitely YES! I would LOVE to have one of these for Christmas. 🙂 Do you sew Cathy or is there someone in your family who could make you one? You could always send them the link as a ‘hint’! what a great project. I think my kids would totally love one of these. 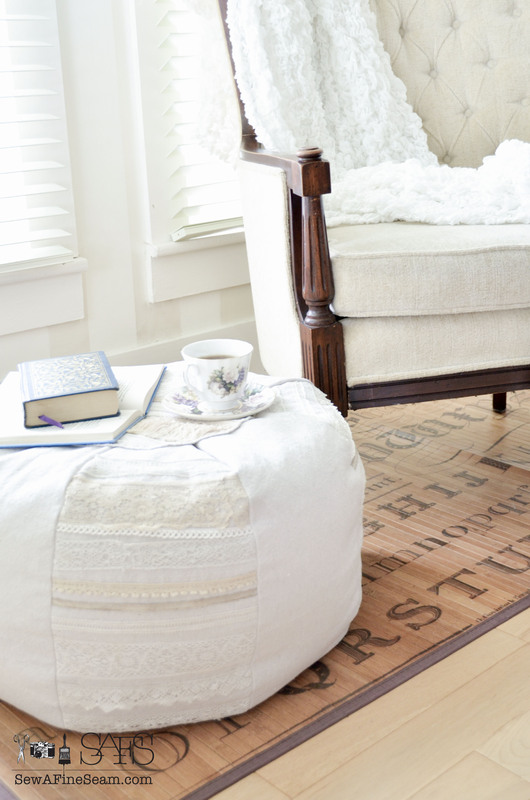 Could be a great “side table” for them, since their beds are not as high off the floor. I am pinning this for sure. Thanks Daniela. They are easy to make and quite fun! Jana, the pouffes in the photos are all the same size – if some look larger it’s simply the photo! I’ve never made a bigger one – these take enough fill the way it is! Your pouffes are lovely! 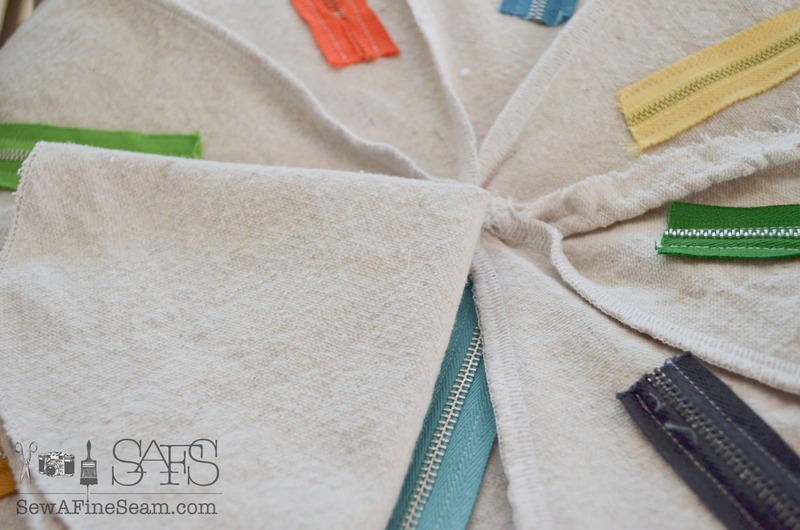 I don’t have a sewing machine but this project makes me want to try. Do you sell your pouffes? The fabric is beautiful.. Makes me want to make pillows and dish towels, chair covers! Haha. Thank you Elizabeth! I have sold a few pouffes but they are rather expensive to ship so not a whole lot! I’m sure you could sew anythign you want to if your heart is really in it! Thank you so much for the directions and the pattern. I have been wanting to make a couple ever since you shared these and now I can. Thank you for being so gracious. 🙂 Have fun sewing Cheryl! I am curious if you HAVE to use bean bag fill or if you could use some fiber fill, etc. Have you tried it with any other stuffing? Would that make it machine washable? Jennifer, you can stuff the pouffe with whatever you want. I’ve even heard of people stuff them full of plastic shopping bags. This pouffe is way too big to go in my washer so that’s not an option. Spot cleaning is all I do. 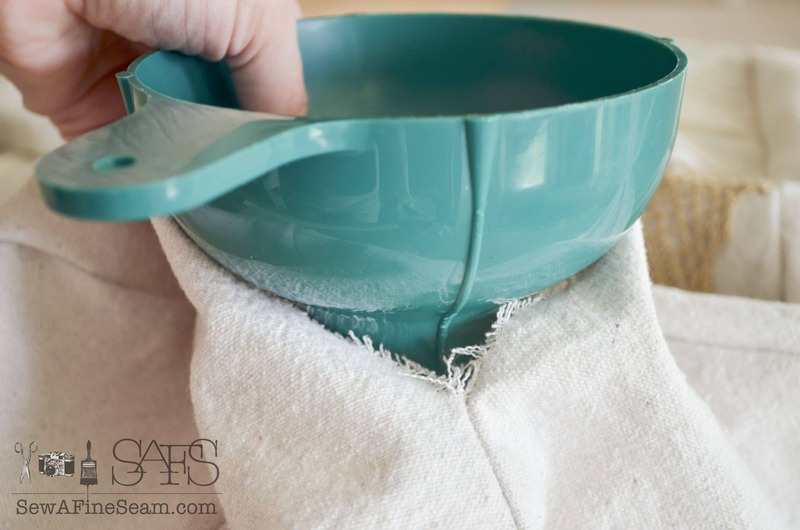 To make them truly washable they need to have a zipper and an inner liner that holds the stuffing – so the outer cover can come off to be washed. But doing them that way takes a lot more time and honestly I don’t want to take the time it would take to figure out how to add a zipper and still make it look the same. I like my pouffes really REALLY full of stuffing. THis design wouldn’t work to get a cover with a zipper over a super stuffed liner. Hi Kelly, I can’t remember if I already replied to you via email or not – I am not taking orders at this time as I’m just too busy. If you have someone in your area who you could hire to make you one the pattern is available for sale! I tried to purchase your pattern, but it says it is unavailable and is coming soon. When will this be available again? Would love to buy! Thanks!